Kamloops, B.C. : Local residential and commercial property management and development company, Kelson Group, is pleased to announce their newest acquisition, and it may be the most significant one within their Kamloops portfolio to date. Their vision to add to the vibrancy of Kamloops' downtown core is clear with their focus now moving to community consultation on the project. In a deal just inked days ago, Kelson Group made a significant, multi-million dollar purchase of The Pines and The Oaks, two quality, concrete ten-storey apartment buildings, parcels of land in between 4th and 5th Avenue on both Nicola Street and Battle Street, plus the vacant lot on the northeast corner of St. Paul Street. In total, the purchase includes 3.44 acres of land. The company has some innovative and exciting ideas to develop the area. "We are absolutely delighted to add this real estate to our portfolio. It's a real win-win," says Kelson Group founder and President, Ron Fawcett. "The opportunity to purchase the various parcels of land including two residential towers here in our own backyard is just fantastic for our company. We are now looking forward to sharing our vision and seeking our community's feedback to help us craft our plans to make this a signature area in Kamloops' downtown core." "We're in the very early stages of planning right now, but we're certainly clear on our focus to build more housing and add to the vibrancy of the downtown core with whatever we do," says Jason Fawcett, Vice President of Operations for Kelson Group. "Over the next few years, upon turnover of our residents, we will be renovating the 165 suites at The Pines and The Oaks as well as the common areas and interiors of the ten storey buildings. With the parcels of land which were a part of the purchase, we are looking to build four to six multifamily buildings within the next 10 years which will add 300 to 500 new residential units downtown, comprised of a mix of rental suites, condos, and townhomes. We'd like to add in unique green spaces to enhance the feeling of a social, interactive, and connected community for the overall development. It's really quite exciting for our team and we hope for the community as well." A highlight of the deal for the Kelson Group family was to not only purchase the real estate in the downtown core of Kamloops, but to also purchase it from Argus Homes, another local, family owned company that built the high-rises in the 1960s and managed the properties for three generations. Since 1974, Kelson Group's long-term vision has been to maintain and hold properties. 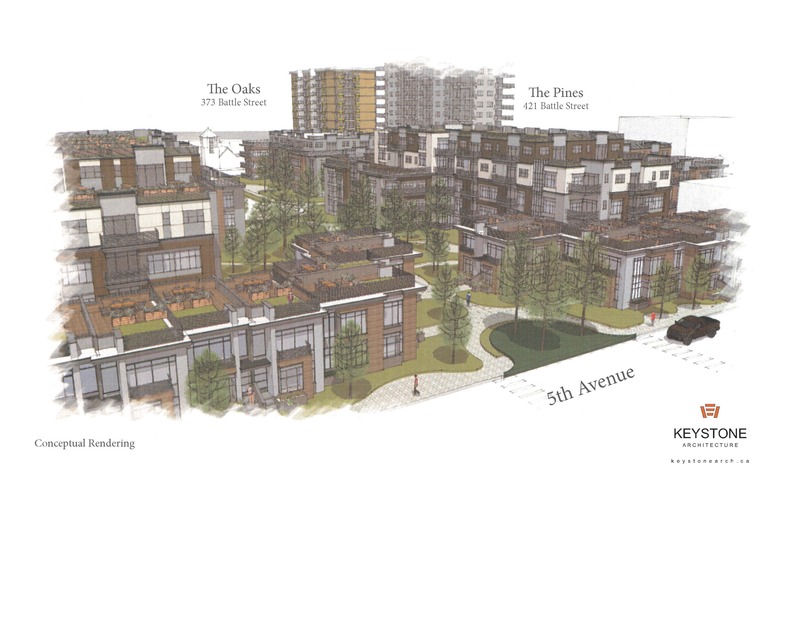 The purchase and the plans for the downtown Kamloops project, along with the new developments at TRU, Peterson Landing, Abbotsford, Langley, and three in Surrey, solidify Kelson Group's focus on building new living spaces. "It's a newer added focus for us," says Jason. "But an area we're seeing great success in and the future looks bright." "Not only are we always improving our existing buildings, but we again have the opportunity to start a project literally from the ground up. With this new downtown Kamloops project, we believe we have the opportunity to reimagine what our downtown core could look like in the future. Enhancing the lifestyle for residents to live, work, and enjoy their downtown neighbourhood while increasing density to further help area businesses thrive are a few of our goals, and we couldn't be more excited." Kelson Group is now moving to a community engagement and consultation phase for the project. Further updates on the development are expected in the spring of 2018. About Kelson Group: the Kelson Group is a family owned company that started managing its first property over 40 years ago. Today, the company has over 85 employees and over 50 rental buildings throughout B.C. and Alberta making the company one of the largest private property owners/managers in Western Canada. The company's B.C. properties have newly been accredited by the Certified Rental Building Program with plans to accredit the new Kamloops apartment buildings as well.